The University of Queensland has launched an exciting initiative that aims to address the financial and practical barriers preventing many school students from reaching university. The UQ Young Achievers program kicks off today when 83 students converge on the University to accept their scholarship of ongoing support through secondary school and a guaranteed place at UQ. The program provides support to deserving students from families experiencing financial hardship, rural isolation, Indigenous students and those who would be the first person in their immediate family to study at university. The Director of UQ’s Office of Prospective Students and Scholarships Margaret Fairman said this program was the result of the business and academic worlds coming together to help change the demographic of students attending university. “Education is the key to overcoming social and economic disadvantage. Programs such as this will help to raise the tertiary aspirations of school students who may not otherwise have considered university,” she said. 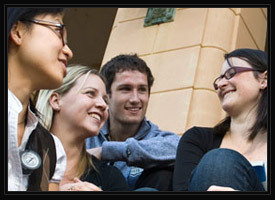 Students who transition to UQ will receive a scholarship valued at $6000 per year for up to four years. In addition, the UQ Young Achievers will receive practical support including career planning, advice on study options, mentoring by UQ students and on-campus experiences to help overcome the real and perceived barriers they face. In its inaugural year, the UQ Young Achievers Program will help more than 80 students, including 14 Indigenous students from schools in the Moreton, Darling Downs and South West regions, to complete Year 11 and 12. Students from Ipswich, Toowoomba, Goondiwindi, Chinchilla, Roma and as far away as Charleville will travel to UQ this weekend to experience university life. The UQ Young Achievers Program was made possible by a generous donation from Mr Andrew Brice, co-founder of online accommodation website Wotif.com, and is co-funded by The University of Queensland. Mr Brice said his family wanted to take the opportunity to make a human connection through this program. “It’s a chance to inspire and motivate young Australians to take every chance they can get in life to be their best,” he said. As part of the program, the students will also benefit from industry mentoring. “I am delighted that many of the staff at Wotif.com have agreed to become involved as industry mentors in the program,” he said. This donation follows a universal trend of benefactors wishing to become more engaged with their contributions. Mr Brice said he wished to throw down the gauntlet to other donors and members of the business community to get behind the program and make an investment in the next generation of Australian leaders. “As a businessman, I know if you make a good investment it will pay dividends for the community. This program has the potential to reach a far great number of students if other donors wish to contribute,” he said. One Young Achiever is 15-year-old Tayla Panting who dreams of one day helping others as a lawyer. Coming from a single parent family, Tayla faced a significant financial barrier to get to University. “Tayla was always going to get there – but without this program I might have had to work to age 100 to make it happen,” her Mum Jen Petty said. “I can’t thank the Brices and UQ enough. The program doesn’t just offer financial assistance, but ongoing mentoring and counselling which will be invaluable for Tayla,” she said. Media: Margaret Fairman, telephone 07 33467704 or Jan King 0413 601 248.